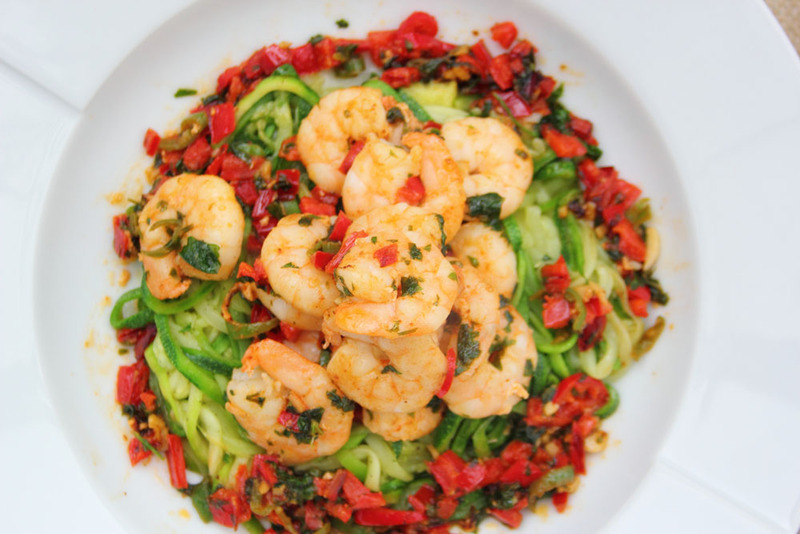 Courgetti with Spicy Prawns – Flogging Delicious! We’ve always liked squashes, and particularly summer squashes like courgettes. So it’s safe to say that we’ve really been loving the recent courgetti craze! A fantastic alternative to pasta, it makes a healthier and lighter option at mealtimes, and especially at dinner when many of us might be trying to avoid those pesky carbs. This week, we’ve teamed delicious courgettes with some jazzed-up prawns, tossed with coriander, peppers, lime, chillies and garlic. It’s always amazing how so few ingredients can come together so well, but these are honestly so delicious with the prawns! What’s even better is this dish takes no time at all to make, and can go from chopping board to plate in less than 20 minutes! 1. Dice your pointed red peppers, chop your chillies, garlic and coriander. 2. 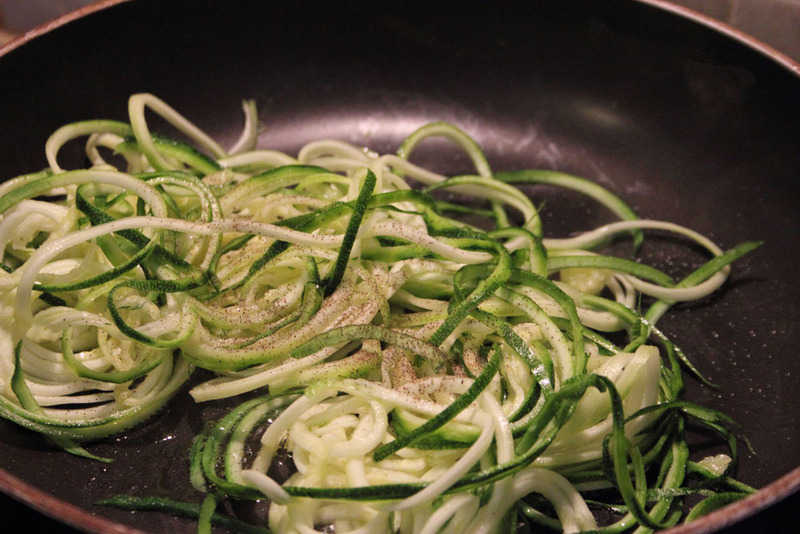 Spiralize your courgettes and cut evenly to make into courgetti. 3, Heat 1 tbsp of oil and the butter on medium heat in a large frying pan and once hot, add in your peppers and fry lightly until they start to soften. 4. In a separate pan, add the remaining oil and bring up to heat before adding in your courgetti and seasoning. Toss lightly until slightly softened, remove from the heat and drain any excess water from the courgetti. 5. 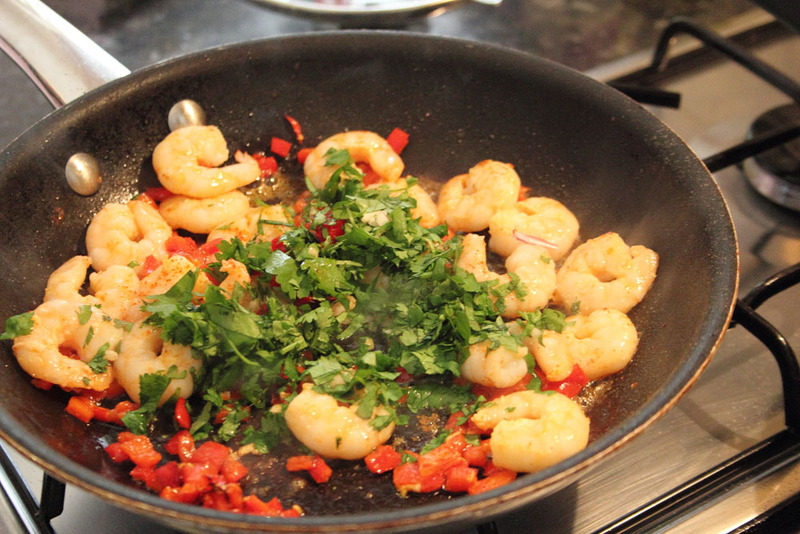 Add in the prawns to your peppers and once they start to turn pink, turn them and add in the garlic, chillies, coriander, chilli powder, salt and pepper. 6. Stir until well combined and the prawns are pink and opaque all the way through. Stir in the lime juice and remove from the heat. 7. Divide your sautéed courgetti into two plates and top with the prawns and the pepper mix.